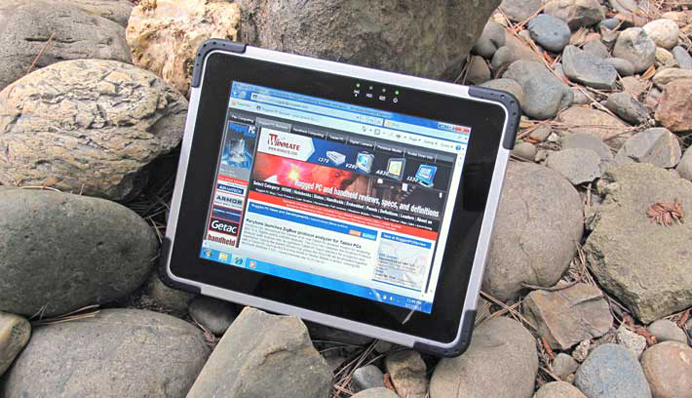 The tablet form factor is gaining almost universal acceptance and there is an increasing need for beefier tablets that are inherently more capable of surviving the kinds of drops, bumps and spills experienced out there in the field. That's why Winmate Communication of Taiwan has introduced the M970D, or what the company simply calls their 9.7" rugged tablet. Take one look at the rather elegant 970 and its purpose is clear: It's an iPad-class tablet, but it's tougher than an iPad, and it can run Microsoft Windows. Making a tablet like this is a definite statement in a market that doesn't quite seem to know what it wants other than iPads. Remember, a number of enterprise-oriented tablet products were introduced over the past couple of years, but so far to only limited success. Some failed outright. And while the Android OS dominates the smartphone market, in non-iPad tablets the battle over operating system, screen size and digitizer technology supremacy remains unresolved. Should it be Android, or is it better to hang on to Windows, especially with the more touch-oriented Windows 8 coming up? How big should it be? And with a wide screen, or one like the iPad? Does it need a pen or stylus like all tablets had in the past, or should it be all touch in tougher tablets, too? With this tablet, Winmate presents an answer. If Winmate is right, those who want a tougher iPad — and one that fits right into most existing corporate infrastructures — will go for something that looks and feels and works like an iPad, with the same size and design as much as possible, only tougher and running Windows. And that is what this tablet is all about. Does it make sense? And how well did Winmate execute the concept? The right side shows the power button and a SIM Card slot. 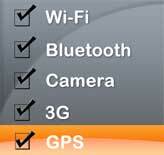 The top features two small speakers and four buttons for volume-up, volume-down, accessing a programmable function, and bringing up on screen menus for brightness, volume, battery status, and one-click access to turning the various wireless radios as well as the camera on/off (see screen shot to the right). The bottom has the power jack, an audio in/out jack, an edge connector that supports either HDMI or LAN via cable, a standard USB 2.0 port, and a surface mount docking connector. Note that all but the surface mount connectors have hinged protective rubber doors. The left side is unadorned. One of the principal design elements of the M970D are the four black bumpers that protect the corners of the tablet. In some tablets, such bumpers are either optional or look like an afterthought, but that's not the case in this tablet. Winmate fully integrated the bumpers into the design while making sure they can easily be replaced. Each bumper consists of two layers, a very tough piece of plastic and then a black rubber layer molded onto it. 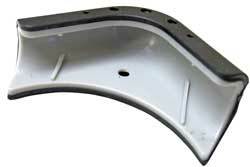 These bumpers definitely provide good edge protection. They also extend a bit out front, and that adds some protection if the tablet falls on its face. The Winmate M970D is powered by a 1.6GHz Intel Atom N2600 processor, and this warrants some discussion. Intel's Atom processors were conceived a few years ago as a simpler, less expensive alternative to Intel's increasingly complex and costly Core processors. Somewhat confusingly split into two different processor families (initially "Silverthorne" for mobile internet devices, and "Diamondville" for low-cost notebooks), Intel scored an unexpected hit when inexpensive Intel Atom-powered netbooks took off and sold by the tens of millions. The N2600 processor used in this Winmate tablet is a third generation descendent of those initial netbook CPUs. It was introduced in late 2011 and arrived at a time when netbooks had become all but replaced by tablets, most of which are powered by ARM processors. Windows 7, however, does not run on ARM processors, and so the Windows-based media tablets currently available run on Atom chips. To provide an idea of where the Atom N2600-powered Winmate tablet fits in compared to devices running different kinds of Atom processors, we ran the M970D run our two standard benchmark suites (PassMark and CrystalMark), and also list the results of four tablets we had in the RuggedPCReview.com lab. Though not a tablet, we also included the results of an N270-powered Acer Aspire One netbook, one of the devices that put netbooks on the map. Note added July 6, 2012: as we suspected, the driver in our pre-production unit wasn't final and had a couple of glitches that affected some of the benchmarks. Winmate ran new sets with the final production drivers and we added those to the table in parentheses. The benchmark results, as usual, aren't without seeming contradictions, and they are never easy to interpret. That's because it's in the very nature of benchmarks to measure things a certain way, and when comparing different processors and systems, there will always be some comparing of apples and oranges. In our experience, though, the overall bottomline of a benchmark suite will always present a good measure of a system's perceived day-to-day performance. Looking at the PassMark scores, the Atom N2600's dual core design presents a clear advantage over any of the single core Atom designs, and the CrystalMark scores confirm that. In terms of sheer computing power, the N2600 is almost twice as fast as any of the other chips. Disk benchmark scores are notoriously uneven across different storage technologies, and in this lineup we had various types of SSDs, mSATA, and conventional hard disks. Here, the Winmate tablet's 16GB SSD had a midrange score. The benchmark results are confusing when it comes to graphics. The PassMark 3D Graphics Mark is twice what we usually find in Atom Zxxx series systems, but lagged behind our old N270-based Acer Aspire netbook. 2D graphics benchmark tests were inexplicably low though perceived 2D graphics performance was very good. The CrystalMark OGL test, however, was sensational, with the Winmate tablet outperforming any device we ever tested that did not have discrete graphics. As far as perceived, subjective performance goes, the Winmate M970D did very well. The tablet feels quick and snappy, with performance reminiscent of a low voltage Core 2 Duo rather than an Atom system. HD video playback, likewise, was flawless. The overall impression here is that the N2600 is a happy choice for this class of machine. Note, of course, that real world battery life varies with power settings (selectable either via the Windows Control Panel or a special Winmate Hot Tab utility), display brightness, and system usage. A tablet's display can make or break the product. We expect a bright, vibrant screen these days, one that is rock-solid, displays every detail, and shows deep, rich color. The days where a bit of flickering or color-banding was acceptable are long gone, and color-shifts as you look at the screen from different angles are a definite no-no. To realize just how important displays have become, look no farther than the iPhone and iPad where Apple redefined the rules once again with their "retina" displays. The idea there is that individual pixels are so small that the eye can no longer see them. For now, no one has a display like the latest iPad with its incredible 2048 x 1536 quadruple XGA resolution, and you wouldn't expect a rugged tablet to come anywhere close to that latest iPad. Yet, amazingly, Winmate accepted the challenge and came up with a screen that is far, far better than it has any right to be. In fact and everyday use, in most applications it looks every bit as good as the vaunted new iPad that has quadruple the resolution. If that sounds unbelievable, well, take a look at the pictures below. 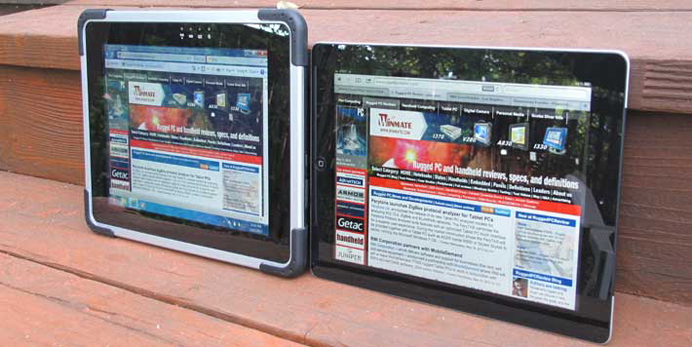 The first picture shows the Winmate M970D and the new iPad side by side outdoors on a bright California mid-morning. Both have their brightness cranked up to the maximum. It's hard to tell a difference. Unfortunately, however, the Winmate tablet's screen shares a quality of the iPad display that we're not too fond off, the high gloss. We always do test pictures from angles to check for reflections or deterioration of display viewability. In this case, both display surfaces reflected, but the picture stayed bright and clear, without any color shifts or aberrations. Far too many displays suffer from narrow horizontal or vertical viewing angles that has users forever hunting for the right angle to get the best viewing experience. That's simply not an issue on the Winmate M970D. For all practical purposes, this display has a usable viewing angle of 180 degrees in any direction. Winmate describes their screen as an "IPS LED" panel. IPS stands for In-Plane Switching, a technology where the liquid crystals stay parallel to the panel as opposed to twisting at angles. This requires twice as many transistors and generally a stronger backlight, but results in those perfect viewing angles and complete lack of color shifts. The picture below shows the worst case scenario any computer display faces outdoors: that of facing the sky directly in bright sunlight. That's a real challenge for transmissive screen designs where the backlight easily gets overpowered by the sun, resulting in a loss of most contrast. This is not the place for a long discussion of the various indoor/outdoor display technologies. As is, the Winmate display is too good indoors to be a transflective design, yet in direct sunlight it does retain acceptable contrast. That usually means optical filters and polarizers, but looking at the display through a polarizing sunglass lens does not change the picture when the glasses are rotated whereas the iPad's display goes black. Winmate says the display does not use filters or polarizers, which makes its display qualities even more amazing. The final picture below shows the Winmate tablet in broad daylight, but with reflections blocked with a piece of cardboard. The picture itself is completely unretouched, demonstrating just how bright and vibrant the display is. While Apple makes no specific claims to being sunlight-readable, iPads are actually gratifyingly bright, but not quite as bright as Winmate's M970D tablet. Its listed brightness is 350 nits, which compares to between 150 and 200 nits for your average consumer notebook. Reflections, on the other hand, are an issue. When we recently reviewed Winmate's 5.7-inch handheld/tablet, we commented that its glossy surface had anti-reflective optical treatments that virtually eliminate distracting reflections outdoors. That unit, however, had a resistive touch screen, and perhaps capacitive touch is sufficiently different to preclude those anti-reflective treatments. Overall, the M970D display is fantastic. Anyone who can live with an iPad's screen reflections, and tens of millions can, will find this Winmate display as crisp and vibrant, and even brighter. Tablets don't have integrated physical keyboards and therefore completely rely on a combination of touch, hardware controls, and onscreen menus and utilities for operation. Quick access to often used functions is important for ease-of-use, and Winmate provides a number of ways to make that happen. A hot key pop-up utility lets you assign the sole F1 physical function key on top of the tablet to perform two different tasks or functions via a short or long press. In addition, hot tab can be used to quickly put the machine into one of four different power modes via the "Config" function. For data entry, the Microsoft Input Panel's pop-up keyboard can be sized and placed to the user's preference, and it can also be configured for standard or extended mode (which includes Home, PgUp, PgDn, End, Insert, Pause, PrtScn and ScrLk). You can, of course, also use an external USB or Bluetooth keyboard. Operating temperature is 32 to 122 degrees Fahrenheit (0 to 50 degrees Celsius). That's good enough for most business and field environments, but not for extreme deployments such as commercial freezers or desertlike climates. The M970D can handle a drop from four feet to concrete. 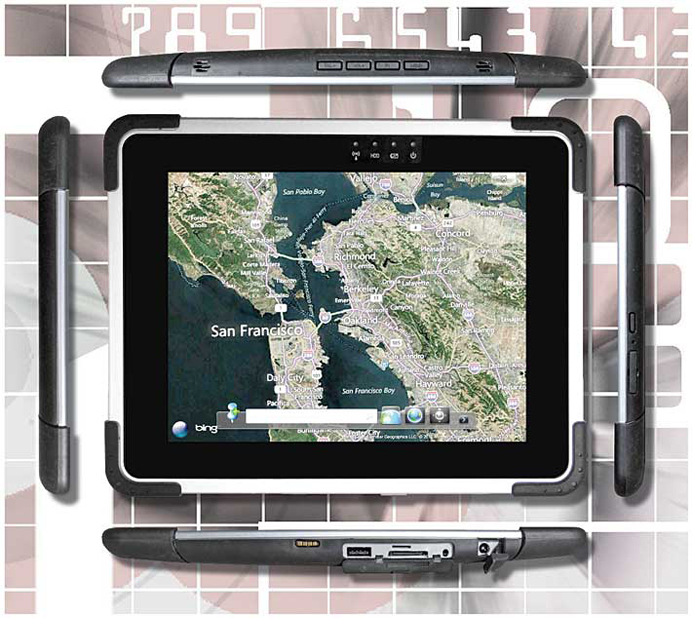 No further details are available, but four feet is about what you'd expect from a ruggedized tablet. Winmate documentation says the tablet was designed for semi-rugged shock and vibration protection. We'd like to see more detail. IP54 sealing, which means it's protected against dust, and it can also handle water spray from all directions, though with limited ingress permitted for both (we never like to hear that). The M970D definitely feels like it can handle more abuse than your standard media tablet. There isn't anything that looks like it could break or twist off. The rubberized bumpers provide corner and edge protection, and the display feels sturdy. However, given that a major reason d'etre for this tablet is extra ruggedness, Winmate should spell out, in all the usual categories and in more detail, just how rugged the device is. We'd also like to see a better and more precise fit for all of the protective rubber doors. Power Li-Ion 5,300Ah, 11.1V (est.) "up to 5 hours"
If you have any technical questions,sample request,or require more product details, please contact your current Winmate Distributor or local Winmate vendor.If you can not reach them, welcome to send enquiry to newsletter@winmate.com.tw and we will help you to find immediate support inshort time.